Well, here we go with the first gift guide of the 2016 holiday season! I’m doing things a little bit differently this year and I can’t wait to share all of it with you. I’ll be doing weekly gift guides with different brands, recipients and price points. You can also check out the “Very Merry Holiday” category in the top navigation of the site and you’ll find all of my gift guides as they are published, outfit ideas for the holidays and regularly updated gift ideas. Also, if you look in the right sidebar, you’ll see my top 5 gift picks, which will change every Monday from now till Christmas. You can also keep up with me on Pinterest where I’ll be adding my favorite gift picks to this board on a daily basis! Looking for specific ideas? Tweet me (@ninarand), send me a Facebook message or an E-mail, or leave me a comment on any post and I will do my best to integrate your requests into upcoming gift guides and features! Stay tuned for lots of great gift ideas, a few giveaways and inspiration to fill your holiday season with happiness, success and style! 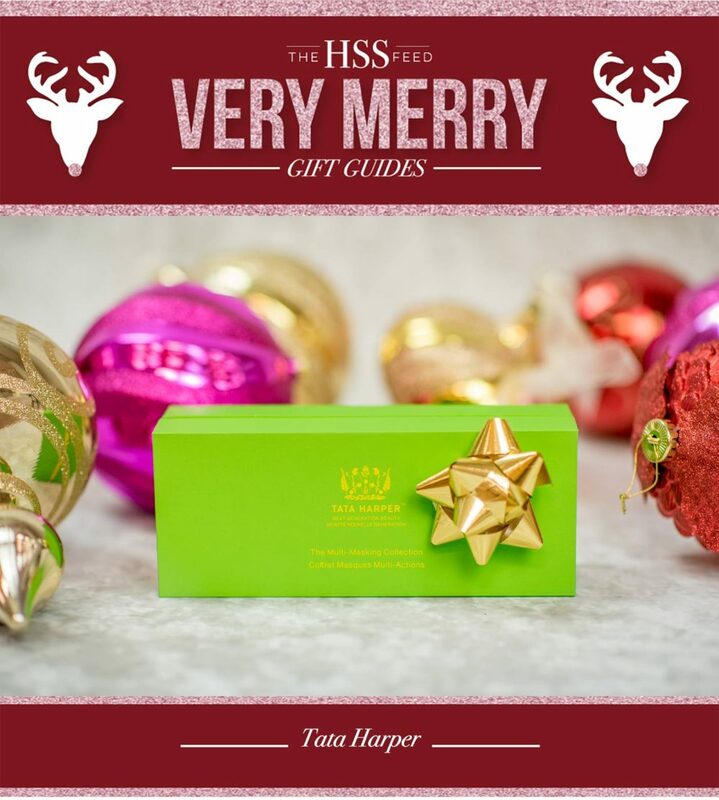 Beauty gifts are some of my favorite to give (and receive), and today I’m sharing some great gift ideas from Tata Harper. I really began to use Tata Harper products during my pregnancy because they are natural, organic and non-toxic. And now, there are a couple of them that I may never stop using like the Hydrating Floral Essence and the Resurfacing Mask. The Aromatic Stress Treatment (#3) is a great stocking stuffer! It’s a great gift for friends who work long hours at a stressful job, new moms or even pick one up for yourself during this crazy time of year! The Volumizing Lip & Cheek tint is a great friend or sister gift and the “Very Naughty” color is a lovely take on a more natural holiday red. To give someone a little extra pampering, the Multi-Masking Gift Set (#7) is perfect! It creates a spa experience at home and would be a great gift for the moms on your list. And speaking of that Multi-Masking Gift Set, how would you like to win one? I’ve partnered with Tata Harper to give away one of these sets to a lucky reader. Keep it for yourself or give it as a gift, and enter on the widget below by 11:59 PM on November 23. The winner will be notified on Friday, November 25. These products sound awesome! I want to try the floral essence! They are great and you’d love the Hydrating Floral Essence – it is so refreshing and smells so pretty! The volumizing lip and cheek tiny sounds great! Such great stocking stuffers. Love Tata Harper!! Their products are amazing! They’re definitely some of my favorites! Which do you like best? Skin care products are perfect gifts for the holidays. Love how You thoroughly described each item. These products sound so luxurious and amazing! I need to give them a try!! I totally agree. Skin care products are such a good gift for ladies! That mask sounds like something I need to try! I’m always asking for beauty items for christmas so this post is right up my alley! This is such an amazing giveaway! I love these products so much! They’re some of my favorites, I’m so excited to give them away! I haven’t heard of this brand before. I need to check it out. It is! And it comes in so many great colors too! Great picks here, thank you for sharing! Love this skimcare brand so much! It’s super effective! Such a great giveaway too! I’ve heard great things about her masks! I love Tata products, there are so good!